High quality realistic terrain is a key element of any wargaming setup. It assists the visual illusion and thus heightens the enjoyment of the game. At the same time, wargaming terrain cannot be as detailed as say model railroad terrain for the simple reason that miniatures have to be able to stand on it. This is especially true for “block” games where large formations of troops require placement flexibility on the tabletop. With the exception of one-time fixed setups, wargaming terrain also needs to be modular so that new battlefields can be created for each game. Below are some images from my terrain collection. Generic terrain is listed on this page. Specialised terrain can be found on the page (28mm village terrain), the page (space combat terrain) and the page (naval combar terrain). The foundation of my generic terrain setup are grass tiles of different sizes. Rivers are built into these tiles but otherwise everything is plain grass. The tiles come in different sizes (4’x2′, 2’x2′, 2’x1′ and 1’x1′) to allow flexible arrangements for the rivers. The plain grass isn’t very realistic (“golf course look”) but the more realistic alternative of using a sand & tuff foundation makes for a less comfortable playing surface (the grass is soft so picking up dice, pushing models and other such activities are very gentle on models and hands). More information about building the terrain tiles can be found on this page. Apart from the rivers that are built into the base tiles, nature offers a few key landscaping items: hills, woods and “difficult ground”. Hill are made from high density foam based on MDF and come in a variety of shapes. I also picked up a plastic Games Workshop hill set when I bought the Battle of Five Armies boxed set. 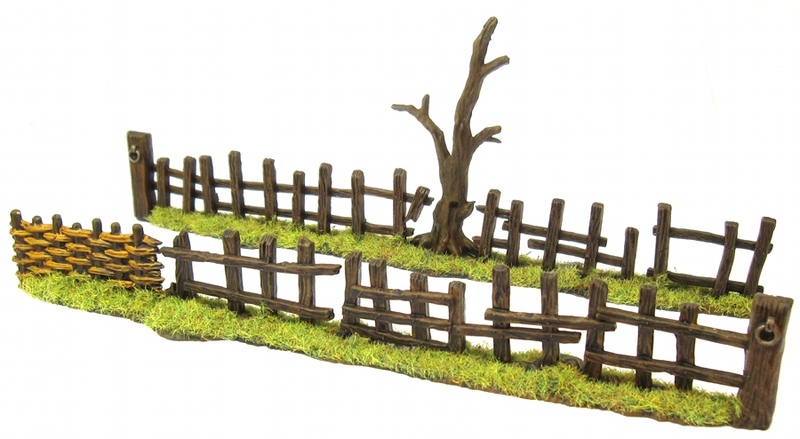 Woods come in two size classes: Big Scale (15mm and above) and Small Scale (10mm and below). The bases are interchangable for both scales and consistent of two layers of MDF. The top layer has 30mm radius holes drilled through them to act as receptors for the 60mm bases of the trees. That prevents tree bases from being visible while still allowing for the removal of indiviual trees during gameplay to make room for models. I also added a few small scale trees on pennies as filler in between the 60mm “group” bases. Difficult ground can mean many things in the wargaming world. The rocky ground are painted up resin pieces as are the craters. The fields are MDF bases with small segments of a door mat placed into them (the door mat pieces can be removed to create harvested fields as well as allow the placement of models. Some of the smaller scale gaming systems make use of roads. I have a set of roads based on rubber (which bends over hills and such) as well as one based on foam. Both systems are modular. 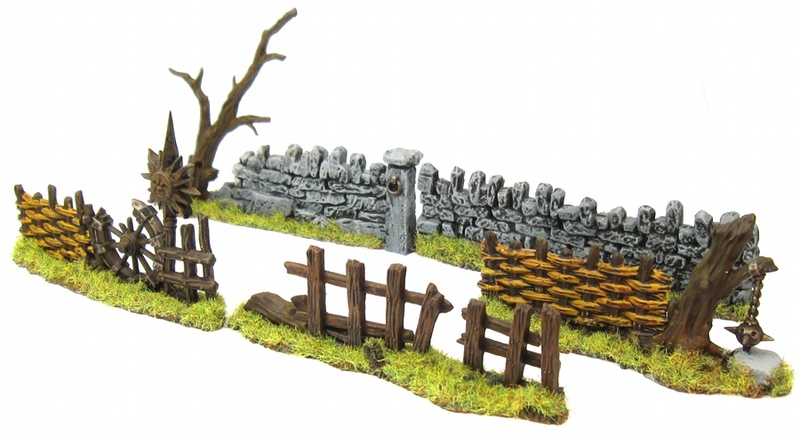 They are both designed for 15mm or smaller scales but could pass as a small trail in a 28mm game if needed. Got me some of those Russian houses on my battle board.